My kids love getting gummy worms (or other animals) as a treat. Sometimes I add the worms to make wormy snacks. 3. Push worm into pudding. 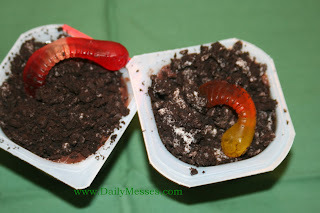 Place worm in ice cream and cover with a layer of crushed cookies. Place in a bowl of fruit salad for a fun snack. Mix in a few gummy worms with goldfish and pretzel sticks/rods to create a fishing themed snack! Cut a hole in the top of a cupcake top, stick in the worm, add a layer of icing, and top icing with crushed chocolate cookies. Make wormy popsicles! Place a gummy worn in a Popsicle mold (or paper cup), cover with juice or other drink. Insert stick and freeze!